In 2014, residential and commercial buildings accounted for 41% of total U.S. energy consumption. Energy-efficiency improvements to seal leaks and weatherize buildings could reduce energy consumption and improve occupant comfort. Oftentimes, an energy audit is used to identify areas where a building may be losing heat or wasting electricity. Simulations built from the audit data can help identify opportunities to realize energy savings, however, current energy modeling and audit procedures are very costly because they require significant time and labor to complete. New ways to rapidly and inexpensively capture energy-relevant data and assemble accurate building energy models could enable building energy managers to implement high-impact energy-efficiency improvements. The University of California, Berkeley (UC Berkeley) and Indoor Reality are developing a portable scanning system and the associated software to rapidly generate indoor thermal and physical building maps. This will allow for cost-effective identification of building inefficiencies and recommendation of energy-saving measures. 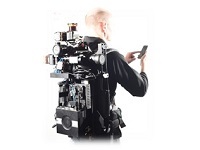 The scanning system is contained in a backpack which an operator would wear while walking through a building along with a handheld scanner. The backpack features sensors that collect building data such as room size and shape along with associated thermal characteristics. These data can then be automatically processed to detect building elements, such as windows and lighting, and then generate 2D floor plans and 3D maps of the building geometry and thermal features. The backpack technology enables rapid data collection and export to existing computer models to guide strategies that could reduce building energy usage. Because the skills required to operate this technology are less than required for a traditional energy audit and the process is significantly faster, the overall cost of the audit can be reduced and the accuracy of the collected data is improved. This reduced cost should incentivize more building managers to conduct energy audits and implement energy saving measures. If successful, UC Berkeley and Indoor Reality's backpack would reduce the cost of a building energy audit and energy simulation by 30-40%. Cost-effective building energy modeling technologies could facilitate the identification of energy-saving opportunities and lower demand for energy. Better building energy efficiency would reduce electricity consumption and associated CO2 emissions. Improvements in heating and cooling building efficiency could save businesses money on their utility bills. The Berkeley team has developed a wearable backpack device with the ability to audit the energy efficiency of buildings. The team formed a startup company, Indoor Reality, to continue development and commercialization of the backpack and associated software built for indoor building mapping and energy auditing. As a first market, Indoor Reality is targeting the Architecture, Engineering, and Construction (AEC) industry, where there is strong demand for accurate, as-built data to confirm adherence to building plans. Beyond this application, the team will target energy-auditing in jurisdictions sensitive to building energy use. About 3.8 billion square feet of building space in the U.S. must adhere to energy benchmarking, transparency, or audit policies, making these buildings ideal candidates for Berkeley’s device and software. The team plans to employ a service-based business model in which Indoor Reality (or a partner) manages the physical survey and the subsequent online 3D renderings and analysis of the captured data serve as the principal paid product. The Berkeley team built off their foundational work by enhancing the accuracy and scalability of the sensor algorithms and integrating the data from added infrared cameras to the simultaneous localization and mapping (SLAM) output. The team synchronized the thermal imaging data with the existing SLAM data to assemble visible and infrared (IR) point clouds with improved localization accuracy and scalability. Next, the team improved sensing and detection algorithms, and then combined and streamlined the SLAM and building element data for easy importation into the EnergyPlus building-modeling environment. After two years, the team was able to demonstrate a backpack audit of an approximately 69,000-square-foot building, performed in one-sixth the time of a manual audit. Continuing work includes streamlining and automating many of the software detection and processing algorithms that are currently manually operated.